I think the December project is finally beginning to takes its toll on me, watching 26 films in the last 6 days hasn't been difficult, its writing 26 reviews to go along with them, which are all beginning to sound the same, and to anyone who reads them I sincerely apologize. Anyways, tonight I was looking for an easy watch and after flip flopping through many titles, I finally decide on 'Eyes Without a Face', was it an easy watch ? no, was it a masterpiece ? yes! After he is the cause of the disfigurement of his daughter,Christiane's face in a car accident, Dr. Génessier, helped by his loyal assistant Louise, abduct young blue eyed women in order to steal their face and put it on Christiane's. 'Eyes Without a Face' is a triumph of a film in every sense of the word. 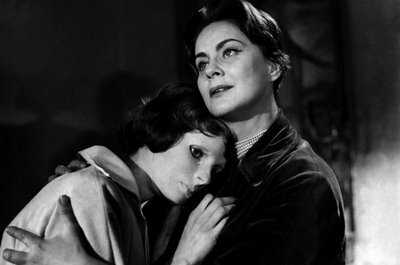 Its orchestrated to near perfection in the filmmaking aspect by Director Georges Franju, and its also a triumph in storytelling thanks to its four screenwriters, including Pierre Boileau & Thomas Narcejac. The film is absolutely terrifying! while it has a fantastical plot, which is scary enough, it also displays a real horror and fear in abduction, Young women getting abducted and being litrely stripped of their identity but for no vengeful or spiteful intentions, but just because they have the right look. Dr. Génessier is a deeply flawed human being and obviously a little sick but he never really seems angrily psychotic towards his victims, 'Feed her,take care of her', he tells Louis after operating on Edna. 'Eyes Without a Face' is such a visceral and haunting experience, and it may be one of the most well executed horror films I have ever seen. Its incredibly graphic but it also haunts you on a deeper and more emotional level, which so few films can achieve. There is an girl in this film whom is arrested for shoplifting, she is innocent and sweet and obviously not a harmful person, the police then bribe her to got to Dr. Génessier's ward in an attempt to see if he is hiding something, she does so and is abducted, and I could not believe how much I felt grief for and sympathized with this character I knew almost nothing about, that's a mark of a great film, when you can muster a feeling for even the smallest character on screen. The are so many enthralling and intriguing characters on screen, of course there is Dr. Génessier, who can gain sympathy for the fact that he is attempting to restore a problem he created out of the love for his own daughter, but at the same time you loathe the main because of his mutilation of these innocent people. Louise is also an interesting character, she is basically Dr. Génessier's sidekick who is forever in debt to him because he restored her face once upon a time. And of course there is Christiane, the reason behind Génessier's grizzly crimes, she is such an intriguing figure through the film as she gracefully wonders through the estate wearing her emotionless face mask, and even portrays the theme of Euthanasia. For a film I was hoping would be a quick watch, 'Eyes Without a Face' was anything but, Actually I think it will stay with me for a long,long time. A beautiful and haunting masterpiece that I cant recommend highly enough. I was actually expecting to write a shorter review here, but that would be impossible with 'Eyes Without a Face' because it is a film that makes you remember why you love this art form so much to begin with.